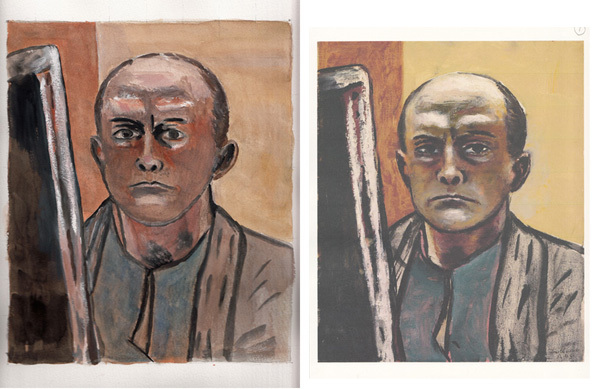 Max Beckmann was the 3rd Artist in this series, and his apprentice was a UK painter named Gillian Lee Smith. I knew very little about Beckmann, a German Expressionist Painter, but quickly learned that he was second only to Rembrandt in the number of self-portraits he painted. He was born in Leipzig Germany in 1884, and decided very early that he wanted to be an artist. He served in WWI as a medic but had an emotional breakdown and was medically discharged. By 1930 he was a very successful German artist, but he was featured in the Degenerate Art exhibit in 1937 and his career destroyed. He and his wife fled to Amsterdam for 10 years and then to the United States after WWII. He had an art school teaching position in St. Louis and then New York, and died in Central Park in 1950 on a walk between his apartment and the Metropolitan Museum of Art to see one of his paintings. I chose Self-Portrait in Olive and Brown to copy. After doing a copy, each apprentice reflects on what they learned by copying the Master and then paints an original using some of those techniques. I selected a New Year's Eve photo I took this year to paint. Like Beckmann, it captures an individual and a face at one moment in time. 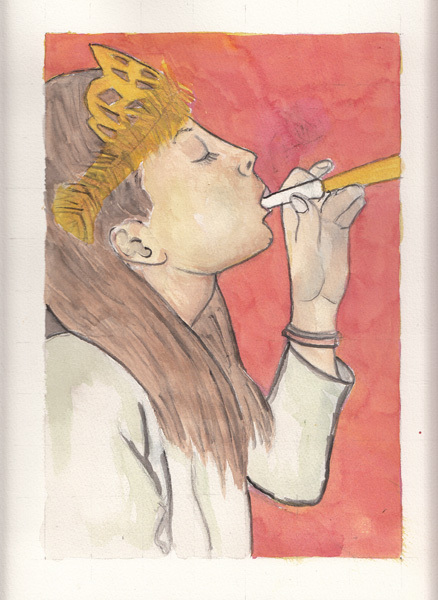 And I hope that it conveys the emotion of a young girl, celebrating the New Year, but in her own world. I tried to use black to define the face and clothing like Beckmann did, but my lines, using a rigger brush are definitely not as bold. Zach is in Pre-K and had his Winter Break several weeks ago. We scheduled a playdate and when I asked him where he wanted to go, he said the Museum so we could sketch. As soon as we got off the phone he packed up his sketchbook and pencils so he wouldn't forget anything. 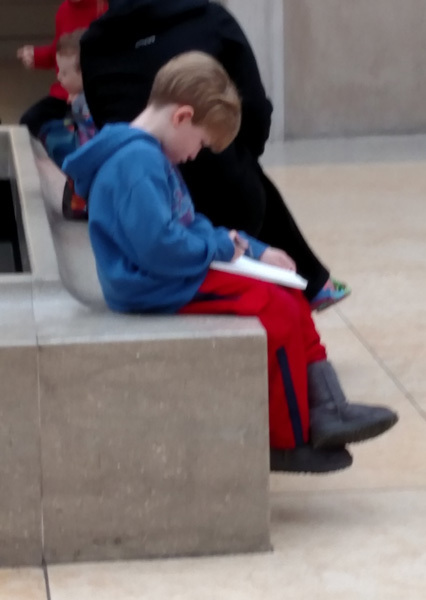 Here is my picture of him sketching in the American Wing at the Metropolitan Museum of Art. There is a Bear Sculpture of 3 Bears, but he was ready to move on after sketching the bear in the middle. 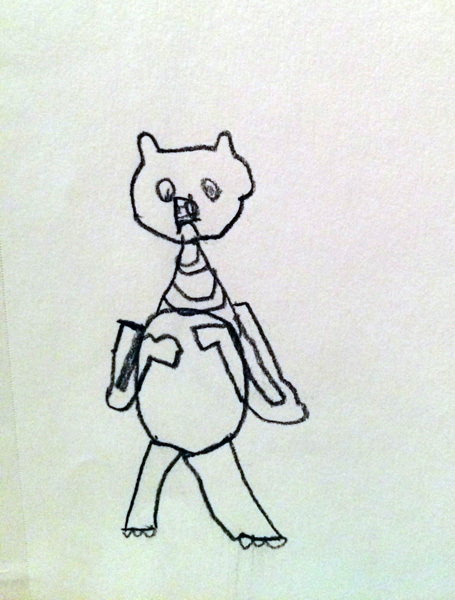 And here is his sketch of the Bear! He was very pleased with it. We eventually did two more sketches, learned lots about mummies in the Egyptian Galleries and went to visit William the Blue Hippopotamus, the Met's several thousand year old mascot that is also in the Egyptian Gallery. Several of my other grandchildren like to draw and paint and I'm hoping that we can keep this interest alive. We learned a few simple rules about 2-point perspective in our Drawing I class last week. 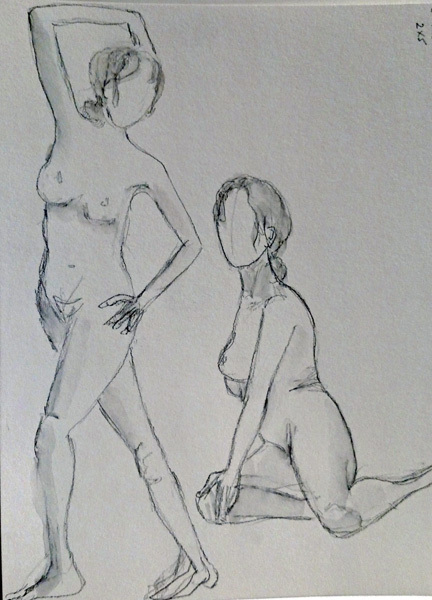 As I've said before, I never had drawing lessons so I used to wing it! Now at least I can intellectually know the rules and maybe even follow them when I choose. You use 2-point perspective when you can see two sides, two planes of an object. 1. Establish your eyeline directly in front of your eyes and put the line on your paper. 2. Draw your vertical line for the corner of the box facing you. 3. Examine the two sides of the box to establish where your vanishing point (VP) will be for each side and mark them on your eyeline. I find it difficult to figure out how far away the VP should be from my vertical and finally just played with this to see the kinds of boxes I could draw. 4. Draw a line from the top and bottom of your first vertical line to your vanishing point - and then add another vertical between these lines to establish the size of each side of the box. 5. Finally, add lines from the VP to the tops of the two new verticals. Here are examples of many boxes I drew in class. We then learned how to draw a corner inside a box - for example the corner of a room. 1. Draw a horizontal line for your eyeline. 2. Draw the vertical line from ceiling to floor. 3. Then put two vanishing points on your eyeline. 4. But this time connect a line from the top and bottom of your vertical to the VP on the opposite side of the vertical. 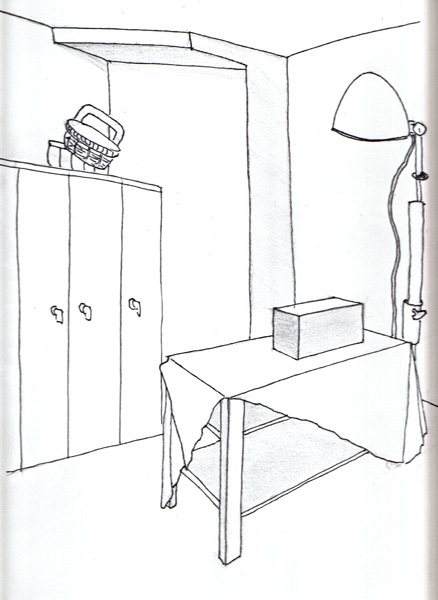 This was hard for me to "see" at first, but here is my drawing for the corner of a room. The green color is on the walls on both sides of the corner. Putting it all together: In order to try to cement these concepts in my brain I drew a box on a rectangular table, looking toward the corner of our classroom. I had to concentrate a great deal to make sure I just wasn't winging it! I look forward to warm days on the streets of Manhattan, playing with these new ideas. Looking down a street of skyscrapers in Manhattan should be great fun to draw. But not when it is 26 degrees at 3PM like today. We spent one more week practicing one point perspective and I think I'm finally gaining practical experience and some understanding of how to use these techniques. Last week we sketched long halls, but the same technique would work for roads and train tracks disappearing in the distance. 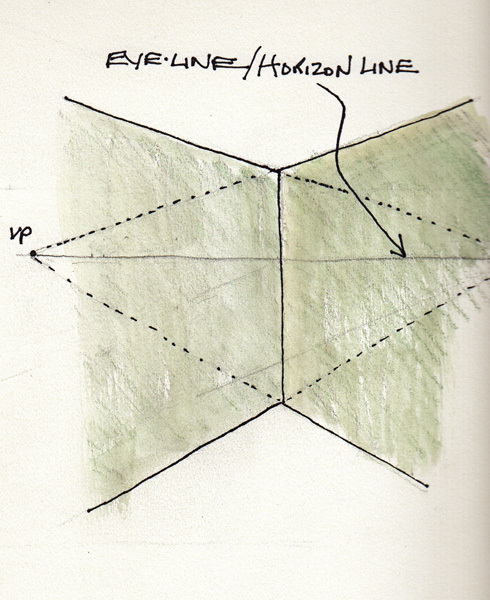 The eyeline or horizon is a line at your eye level, and the vanishing point is directly in front of you on the eyeline. Then your drawing lines all originate from the vanishing point and become your hallway etc. 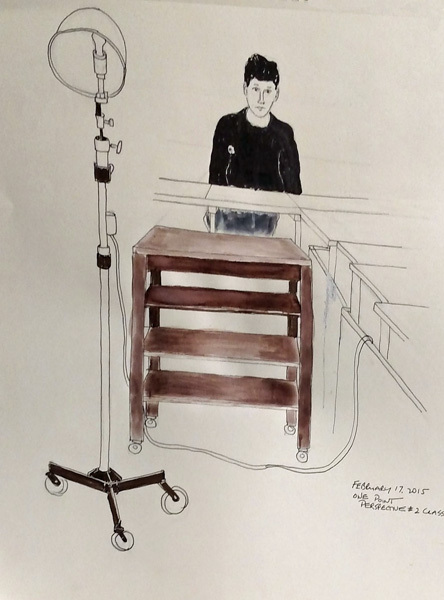 This week I stayed in the classroom and sketched a table that was directly in front of me. One point perspective is used with objects that have flat planes and are directly in front of you. 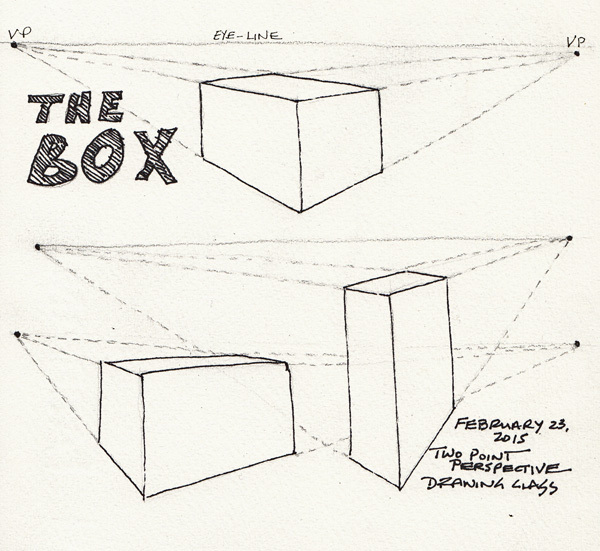 If you can see two sides of a box or table, then you need to use drawing techniques for two-point perspective. As before, the eyeline is at your eye level and the vanishing point is again right in front of you. Same rules, but a new venue. Here is my drawing done in class. My vanishing point is the white dot on the arm of the black sweater. You can start at the vanishing point and extend a line to both sides of the table, each side of the shelves, and the front of the desks on the right. After drawing the table, I struggled while drawing the student desks along the side of the brown table. But again, the lines in the front of these tables are also just lines from my vanishing point. Then I got bored and added the lamp in the room and the student who came in and sat across from me. 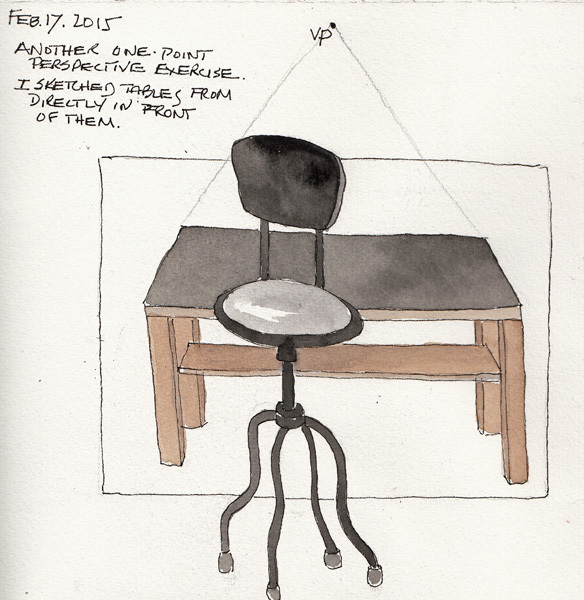 I also sketched another table and one of our classroom chairs in my daily sketchbook to have a record of this class. VP marks my vanishing point and I left my pencil lines from it to the table as a reminder. Our professor confiscates all rulers - he says that if you don't practice drawing straight lines, you will never be able to draw them. Fortunately, I've never relied on a ruler for any drawings.